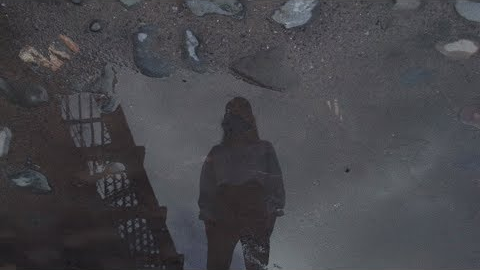 Though not the best example of UK producer and singer Clara La San's incredible debut mixtape Good Mourning, its penultimate track 'Strangers' is the one that's got a video treatment. Why is it not a good representation of the mixtape as a whole? Because 'Strangers' is possibly the track that stands out the most; mainly the 2/4 timing, the marching swing rhythm of the beat and the juddering electro pulsing below everything give it a sense of jaunty electronica, a sense of dum-de-dum which is not found anywhere else on Good Mourning. The track does however showcase the vocals of Clara La San, curling low-key R&B lines as singalongable as any '90s R&B act you can think of; it also shows off the atmosphere that she creates, being an adept as she is at tones and textures, piercing the target in its middle at the confluence of warmth and ice, lo-fi and precision. In particular, the intro and outro send out soft synths like twisting clouds, javelins of sound that siren and scathe: a downtrodden though upward-looking exposition. For listeners less concerned with the leftfield, 'Strangers' is a fair and digestible establishing shot of Good Mourning. Simultaneously, the innate humdrum feel of the beat could be a purposeful illustration of the inexorable depression that, for some, comes with going through the motions and the cyclical nature of the everyday. However, there are tracks on the mixtape that convey this feeling more effectively, and without the relative clutter and jolly bounce which feels somewhat alien to the experience as a whole, tracks like the modern lovesong of 'Gravity', the brooding pop homage that is 'Feel Good'¹ and the scene-setting futurist explosion of opening track 'Rivers', to name just a few where rhythm takes on a different, dynamic guise to what is standard and where synths clang and shudder and where minimalism matters. 🔔 Good Mourning can be variously streamed and downloaded via your favourite online service. 🔔 The video for 'Strangers' was conceived by Parisien director Kevin Elamrani-Lince, and features Clara herself on monochrome urban-industrial backdrops, the sort of grit and overcast skies that feel suitable for the sound conjured in the mournful yet upbeat sound of this track. 🔔 Previously Clara La San has been known for a few feature-spots, for instance lending her vocals to Manchester musicmaker TD Nasty's 'Where U Wanna Be', among others.